Aaaaand another month has gone by, and it's time for the July Component of the Month challenge. 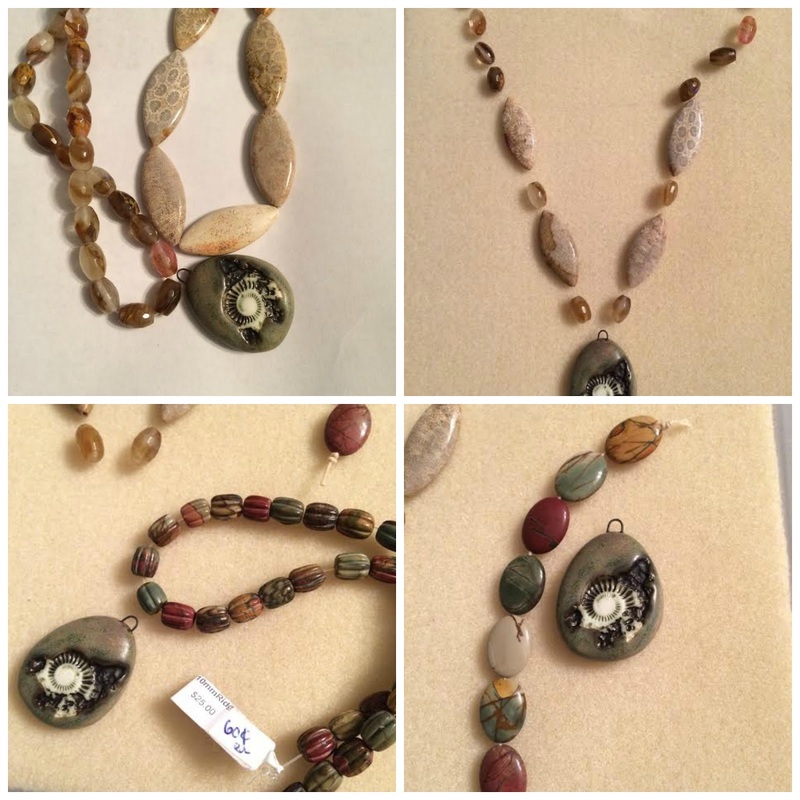 This month, Lesley Watt provided us with these awesome summery ammonite pendants to work with! 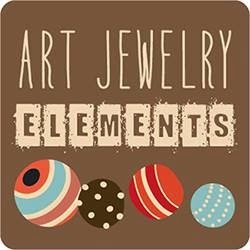 You can get some great ammonite items and more in her Thea Elements shop on etsy. The one I chose is pretty much smack dab in the middle of the photo - the olive green colored one! I had a really hard time with this one, probably because I admire Lesley and her art and the jewelry she makes so much that I wanted to do this pendant justice. I went through many iterations of a design, including trying to use Lesley's tutorial that she posted here. I ordered a bunch of beads I thought would match, I had s-lon cord that was great, and I ordered the chain you'll see below as well. But it just wasn't working for me, so I got out my beads and started trying to come up with another design. I really wanted to use the fossil coral I had, but it just wasn't working. Then I found my red creek jasper beads and felt that they went really well. They pick up the ever-so-slight reddish tint under the green, and the colors in and around the ammonite. I got to work, and made this - not happy with it at all. I hated how it looked with the chain, and the crimp beads showing the way they were. I decided I needed to string the whole piece, not string it in two sections. So then I made this. Aaaaand I think I'm finally happy with it. I wish I had these large tube beads (titanium hematite) in a slightly darker color but this size, but they do pick up the colors in the red creek jasper, so I think I'm good now!!!! Tell me, do you made and unmake and remake the way I did? I'm not the only one? Thanks for stopping by and checking out what I made! Please check out what everyone else made by visiting the blog links below! Sue - I quite like the version with the chain but I get really twitchy about crimps showing too! I love your final piece - the jasper adds just enough colour and warmth to show off the pendant without overpowering it and the whole thing has a lovely earthy quality. Thanks for taking part. Really lovely design Sue, the stones are perfect! Great design! And no you are not the only that takes things apart...I do it with my jewelry and my crochet. I think that is how we learn what works best. And the fact that you took it apart again and again til you felt it was right was awesome! Great beads and colors! OMG I soo know how this feels! I tear apart my stuff at least once! I love your end result! I love to see peoples creative thinking and not just the finished piece, THANKS for sharing! I love how you showed your process Sue, and the Jasper works wonderfully well. I tend to just sit and play until a piece feels right. I really like your final design! And no. You aren't the only who tweaks designs until they are perfect. Excellent end result! And you are SO not the only one who restrings. At least yours ends up somewhat like where you started...mine sometimes not so much LOL! The jasper is wonderful with the focal. I arrange and rearrange things so. many. times... Glad you persevered. Its lovely!